I have seen some stirring and extraordinary concerts at The Sage Gateshead over the past five years but none was more enjoyable than this. It delivered on all fronts - and rather more than I had dared to expect. And this, despite some atrocious weather, meant singer Thea Gilmore and collaborator and spouse Nigel Stonier braved blizzards to drive all the way from Southampton to take part in this grand finale to The Sage's fifth birthday celebrations. As well as being a wonderful musician, Kathryn Tickell is also an engaging host. Aside from her heat-generating playing on fiddle and pipes, her warm personality was an antidote to the freezing conditions outside. 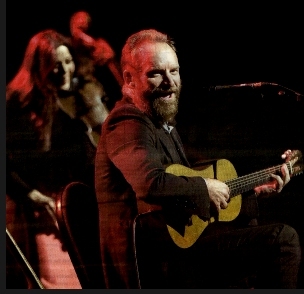 Sting, of course, was the principal guest, making a first appearance at The Sage Gateshead. "I like it here," he declared, surveying a packed Hall One. "At last we have a building that's representative of the extraordinary amount of musical talent from this area." He sang 'The Snow It Melts the Soonest', a folk song also performed on the Jools Holland programme and taught to him by Kathryn Tickell, whom he said he had, known for 20 years. Professing himself not to be a fan of Christmas carols, he sang one he did like, 'The Cherry Tree Carol', which was taken from these shores to America by the 16th century settlers. "Very Appalachian," he remarked. A lot of rude things have been said and written about Sting - about his wealth and his views on the enviromnent - but he really is a fantastic musician and that high-pitched, bluesy voice does send shivers downYour spine. It was brilliant to hear 'Fields of Gold' and 'Every Breath You Take' in such a venue, with every vocal nuance and pluck of the guitar string as audible as a pin dropping. And he made sense of his rock star's life, recalling how his childhood in Wallsend, seeing ships built and sailing away, instilled in him the idea that you had to move out into the world to make a life for yourself. Although he professed to "only speaking Geordie when I'rn annoyed", and said the cold weather was a reminder of why he moved to Italy, he added firmly: "I'm fiercely proud of my roots and very grateful for them." 'Message In A Bottle', "a song I wrote in Newcastle", seemed like a wonderful bonus, given added lustre by the sax playing of Andy Sheppard, another special guest, and members of the Tickell band. One of the great things about this venue is that you can hear something very familiar and imagine you are hearing it for the first time. How many times have we heard 'Message in a Bottle'? Well, speaking or myself, I'd say hundreds. But never quite like this, a song made in Newcastle and taken to the world, its blend of plaintiveness and revelation - you're never alone in feeling alone touched a nerve. What was really great about this gig, though, was that Sting was just an ingredient - albeit the plum in the pudding - of a showcase of extraordinary talent. It began with a long set by Folkestra, the hugely talented folk ensemble managed by Kathryn Tickell in her role as artistic director of Folkworks. Folkestra players past and present joined forces to mark the fifth birthday of a venue whose stages they have graced many times. They appeared in various groupings with 40 of them on stage together at one point. What was great about them, said Kathryn, was that they didn't just perform brilliantly but they also wrote their own musical arrangements. Some past members have gone on to perform professionally or to study on the traditional music degree course run by the Sage and Newcastle University. Their appeal as performers needed no explanation. Kathryn, alternating between fiddle and pipes, paid homage to Joe Scurfield, Willie Taylor and James Hill, notable fiddlers sadly no longer with us, and performed some of her own tunes. With Sheppard, a long-time collaborator, she played a haunting and yet-to-be titled "apocalyptic lament". Thea Gilmore demanded had received audience participation and performed the Christmas song she wrote with the intention of loosening Noddy Holder's stranglehold on the seasonal hit list.